ING DARIUS, THE new ruler, chose one hundred and twenty princes to help him govern the people of his great kingdom. Over these princes he appointed three presidents, and because he found that Daniel was a very wise old man he made Daniel the first president. So Daniel was more highly honored than any of the princes or other presidents. A better feeling of jealousy began to stir in the hearts of these princes and presidents. They hated Daniel because the King had honored him so greatly. They decided to watch him carefully, and find fault with him at their first opportunity. But their careful watching only revealed to them the fact that Daniel was a very faithful man, with no faults that might displease the King. So he permitted them to tell the purpose that had brought them to his palace, and they said, "King Darius, live forever. All the presidents of the kingdom, and the princes, the governors, the counselors, and the captains have planned to establish a royal law and to make it very binding. This is the law: That whoever shall ask a request of any god or man for thirty days, except of you, O King, he shall be cast into a den of lions." Of course Daniel heard about the law. But three times every day Daniel knelt, just as he had done before, and prayed by his opened window with his face toward Jerusalem, the city where God's house used to stand. But finally the sun went down, and the presidents and princes came impatiently to the palace and told the King that his new law must be obeyed. 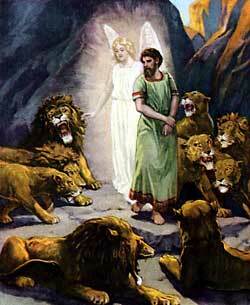 And Darius feared to try longer to save Daniel, so he told them to bring him out and cast him into the lions' den. And he said, "The God whom you serve so faithfully surely will deliver you from the lions." Then he saw Daniel thrown into the den, making Daniel a prisoner inside among the savage beasts. Afterwards, according to the law of his country, he put his own seal upon the great stone, so that no one would dare to remove it without the King's command. Then, with a heavy heart, he went back to his palace. All that night long Darius could not sleep. He was too troubled to enjoy any kind of entertainment, for he thought constantly about his faithful servant in that terrible den. He longed for the morning light, and with the first break of dawn he rose up from his bed and ran quickly to the lions' den. Then, in a troubled, anxious voice, he cried out, "O Daniel, servant of the living God, is your God whom you have served so faithfully able to save you from the lions?" Then the King listened, and soon he heard an answering voice from the deep pit, saying, "O King, live forever. My God has sent his angel, and the angel has shut the mouths of these savage beasts, and they have done me no harm at all. For God has seen that I was not guilty of any wrong-doing before him nor even before you."